Sarjapur is in the south-east of Bangalore and the Sarjapura-Attibele Road is located in its west. Sarjapur is a rapidly developing locality primarily due to its proximity to IT cluster areas like Whitefield, Electronic City, Outer Ring Road, Marathahalli and Koramangala and the presence of IT/ITES companies like Infosys and Wipro. The locality is also home to Billapura Lake. The areas around the locality are Chikkadunnasandra, Gudighattanahalli, Chichuraganapalli, and Ittangur. Apartments dominate residential real estate here. Average price of apartments is Rs 3,900 per sq. ft. Average price of independent houses is Rs5,000 per sq. ft. Average rate of residential plots is Rs 2,500 per sq. ft. 2BHK and 3BHK are the most popular housing units in the locality. 4BHK units are also quite popular with home buyers. Sarjapur has an effective public transport infrastructure.The Sarjapura-Attibele Road connects the locality to Whitefield. 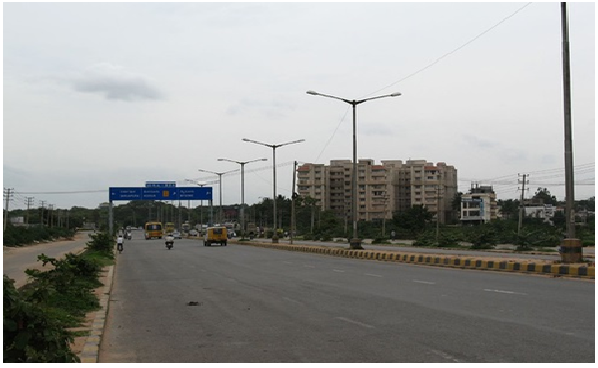 It meets Kanyakumari Road at Attibele, connecting Sarjapurto Electronic City, Koramangala, and Marathahalli. Sarjapur’snearness to ChikkaTirupathi Road adds connectivity to Hoskote, to Devanahalli and Doddaballapura.BMTC buses ply through Sarjapura Police Station Bus Stop.Carmelaram Railway Station, located 11 kmsfrom Sarjapur, helps connect the localityto Bangalore City Junction Railway Station, 30 kms from Sarjapur, facilitating travel to manySouth Indian cities as well as rest of the country. The Kempegowda International Airport is located 61 kms from Sarjapur – and can be reached through the Bangalore-Hyderabad Highway. Oakridge International School, Greenwood High International School, Inventure Academy, and Primus Public School are some of the famous schools in the locality. Krupanidhi Colleges, Amrita School of Engineering, Bangalore Technological Institute, St John’s College of Nursing, ITM Institute of Hotel Management, Bangalore College of Engineering and Technology, and Xavier Institute of Managament and Entrepreneurship are some of the colleges here. St. John's Medical College and Hospital, Greenview Medical Centre, Janani Hospital and Devi Eye Hospital, are some of the healthcare centres in Sarjapur. Sarjapurhas popular malls, apparel stores,groceries and hardware stores. The locality has several hotels and restaurants.Bescom Office, Sub-Registrar Office, Sarjapur Post Office, and Sarjapura Police Station are located here. A strong social and commercial infrastructure in and around the localitywill push up real estate values. Looking to buy your new home or perhaps a good rental investment?RoofandFloor has great listings for projects in Sarjapur Road. Your dream property is just a click away.